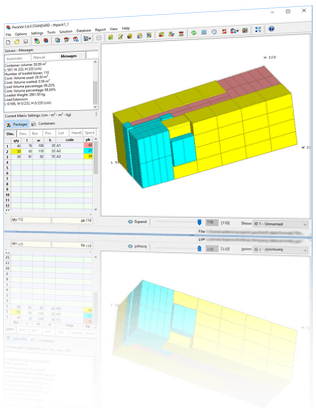 packVol is an Optimization Software for Load Planning, designed to plan the best space utilization inside containers and trucks. It is an innovative software for MS Windows™, with unique features not found in other container loading software, which allows you to efficiently manage complex load planning problems. Reduce transportation costs. Increase efficiency. packVol helps Companies reduce freight costs and time wastes in setting up cost-effective load plan proposals for customers / suppliers. The software adapts easily to the most diverse load planning needs: pallets, racks, trucks, containers, railroad cars. Improve space utilization, reduce transportation costs by 5%-20%. Reduce significantly time spent on planning and drafting of orders. Improve efficiency by enforcing a strict policy on loading procedures. Simplify exchange of information - improve readability of load planning documentation. Fast and effective, thanks to the advanced optimizer, truly three-dimensional. Stable and reliable, packVol is used by hundreds of Customers worldwide. Fully functional without any limitations. Main features, Loading rules and Screenshots sections contain a concise overview of the application features and load rules that you can manage. You can evaluate packVol for free. See Download for more information. The Tutorials will help you familiarize with the working environment and discover the ease of use of the program.